A variety of sports modes: walking, running, cycling, swimming, hiking, basketball, badminton, table tennis, football, etc. Gocomma is a Chinese company that has been competing for years in the gadgets market with the launch of intelligent watches and activity bracelets with a multitude of functions and highly competitive prices. And now introduced a new model, the Gocomma DT28. This new smartwatch stands out for its super low price but also for the multitude of functions it incorporates. 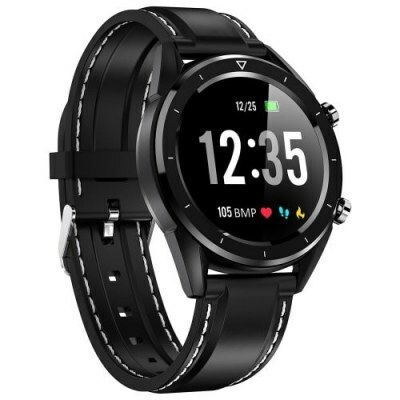 In addition, it does not seem to be a watch of poor quality, as it has HD color touch screen, a zinc alloy housing, stainless steel or silicone strap and a multitude of useful functions that we will see below in detail. First, the new Gocomma DT28 features a 1.54-inch TFT color touch screen (240 x 240 pixel resolution) protected by tempered glass. In addition, the smartwatch housing is made of zinc alloy and can be purchased in black or silver. At the same time, users will have the possibility to choose between two types of watch straps: metal or silicone, which can be easily replaced by others that have the size of 22mm. In terms of internal components, the Gocomma DT28 is equipped with a continuous heart rate meter, a 3-axis accelerometer and Bluetooth 4.2 connectivity. The company also added 64K RAM and 512K storage space and made the watch IP68-certified, so it can be used under the shower, but it is not suitable for diving in water. Thanks to all these functions we have mentioned, the smartwatch will detect the steps accumulated during the day, the calories burned or the distance traveled, and even has special modes for various sports: racing, walking, swimming, cycling, basketball, badminton, table tennis and hiking. As you would expect, the accelerometer and the HR sensor can also be used to record sleeping hours. Another point that catches our attention is that it even offers some functions for the detection of blood pressure and the performance of electrocardiograms by means of a PPG + HRV technology. These functions are unlikely to have medical validity, as is the case with the Apple Watch ECG sensor. Finally, the Gocomma DT28 incorporates a 230 mAh battery whose autonomy is between 5 and 7 days with normal use, and up to 20 days in standby mode.